Weekly Menu Chalkboard Weekend Sale! Earlier today, I started my weekly task of planning out our weekly menu. Sometimes it's more of a taxing task than I'd like it to be. If you're someone who is in charge of this task, you know what I mean. It can feel mundane or frustrating even because sometimes it's just hard to plan. For me, I have to do this. Normally, I have four individual schedules to work around. And for me, I really like to avoid the last minute decision of what to eat. It usually ends up being expensive, something that I don't really want and probably unhealthy. Our weekly menu chalkboard is my absolute favorite thing we've created. Sure, I love our "We Hate Everything Together" stuff, but I use our menu boards every week. I am able to create my grocery list based on my menu plans. This helps me not starve my family. Or want to strangle them when I'm asked 40 times a day "What's for dinner?". Bonus! If there's a clear laid out menu plan, anyone available to cook is empowered to do so! So with Mother's Day on the horizon, I've knocked $5.00 off the normal price for just this weekend only!!! Sale ends 4/30/17 11:59pm PST. Grab one for mom, your roommate, yourself or your best friend! Where in the world is Whidbey Island? When I tell people I'm from an island in the Puget Sound, they instantly assume I'm from Vashon, Bainbridge or one of the San Juans. That always seemed odd to me, because everyone seems to overlook the largest island in the state of Washington - Whidbey Island. It's the fourth largest and longest island in the contiguous United States. I'll openly admit that I've had a long love/hate relationship with the island. My fellow Islanders understand that statement. There are two ways on and off that big rock. (Unless you are lucky enough to own your own boat.) The big tourist attraction that is the Deception Pass Bridge, was my main way off since I grew up 3 miles away from it. There's no place like it. Mother nature is commanding with the deadly currents below the industrial bridge's impressive span where you can view Mount Baker to the east and the Straight of Juan De Fuca to the west. To northenders, the south end was largely for secret fishing spots, the county fair, art galleries, loganberries at the Greenbank Farm and a ferry ride to the mainland. John's first trip to Whidbey Island 2013 - The north side of the Deception Pass Bridge on Fidalgo Island. A desktop cellphone shelf we designed a while back, based on the architecture of the Deception Pass Bridge. I was born in the late 1970's when there were still forests in "downtown" Oak Harbor. Which in later years when I was in high school the parking lots that were once forests became a meeting/hangout spot. A grocery store parking lot. Yes, friends that is an insight to part of the hate relationship I have with the island. There wasn't a whole lot going on. I grew up in a very rural area about 7 miles north of "town". I spent a lot of my time on my bike prior to getting my license. Well, if you knew me then, I did drive a little bit before I had my license. :D In retrospect now, I feel lucky for growing up that way even though I longed for mainlander city life. I know a lot about plants, trees and animals that are native to the island. I was forced to be creative not only for entertainment but also during times the power was out due to 60+ mile hour winds. There are many things like that I share a bond with my childhood friends that no one understands or can relate to. It's kind of special and many of us joke about writing a book to recount our islander childhood. We all seems to share a love and appreciation for that rock now. Whidbey Island - Mini Chalkboard with magnets. Since the inception of our business I've been asked and have created many Whidbey themed items. We all seem to want to have a piece of "home" with us in our lives. While I have a huge list of half-done projects, I've decided to share one item that we made that I love. A Whidbey Island mini chalkboard for my fellow island people. Admittedly, this post took me sometime to write up. "Home" especially with such character is hard to condense down into a few paragraphs. Lasers and love - "Dorothya from The Rock"
In just a little over a week 6 by 6 is hitting the road to San Francisco! 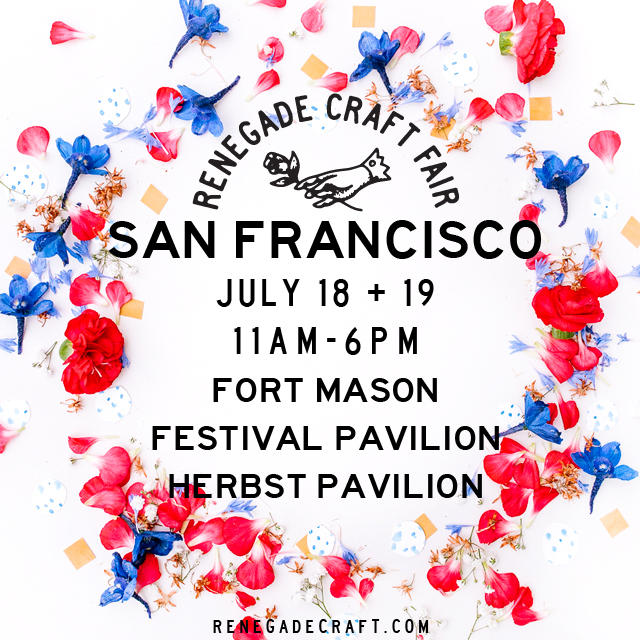 We will be vending at the Renegade Craft Fair San Francisco edition July 18 & 19. We will be at booth #232B in the Herbst Pavilion! Will have our classics (BeerMe, We Hate Everything Together) and much more! Including the West Coast in chalkboard magnet form! That's right! We've completed the continental West Coast of the United States by adding California to the mix! And true to our style they were designed to fit together. We will have loads of the Golden State on hand at Renegade in San Francisco. Unable to come to the show to grab one for yourself? Not a problem, I've just posted them in our shop. We're excited to hit the road and have an adventure! Pictured above is a full sample board with the super strong magnets attached. We decided to keep things simple with this board. Our personal one is much like this. We decided to leave plenty of space for writing. That decision was made because we often write down multiple meals for the day. Most people don't cook multiple meals daily but just in case you do, you have room to write. We selected six colors (check out that goldenrod!) and four unique fonts. You won't be able to find fonts like that in a craft store! I just want to say a little bit about the magnets we chose. THEY ARE RIDICULOUSLY STRONG. They might look tiny but these suckers really stick. We do offer customization for these too! You can add whatever title or name you'd like (within 24 characters) for an additional fee. Otherwise, our stock ones simply say "Family Menu" on top. We hope these find their way into homes that need help keeping organized or homes with kids who ask that day in and day out question to their parental unit "What's for dinner? ".